This definitive biography of George Antonius tells the life story of a man who lived during a dramatic period of history, amid challenge that remains unresolved: the Palestine-Zionist conflict. 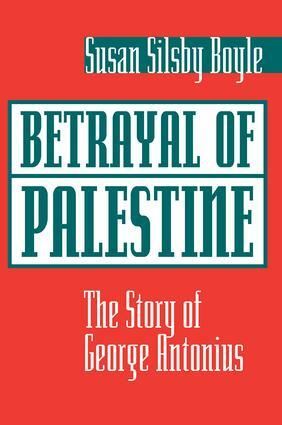 Betrayal of Palestine is an important and innovative work about the continuing controversy of empire and nationalism. This book traces Antonius's contribution and ideas on nation building and good governance and resonates for contemporary seekers of peace in the Middle East. As an archaeology of ideas and meaning, the book will be of great significance for the millennium. It speaks to the paradigm of a conqueror's code, and to the ever present danger of special interests capturing public policy and corrupting good governance.By rediscovering Antonius's message about institutions and nation building, and the true meaning of morality, conscience and public service, Betrayal of Palestine speaks to contemporary people in a voice that reconnects the past with the present. The book offers hope to a region where many solutions have failed, and a reminder that the solutions have been there all along, in the people and traditions of the Middle East, but they have been obscured by a conqueror's code of empire and nationalism. It is a reminder of the genius of democracy and the power of first principles: that ordinary people are important, that power must be shared, and that society as nation transcends tribalism and its more virulent contemporary form: nationalism.